I promised to share some stories about my recent journey to Mexico. It’s taken me a little while, but here it is at last! In March-April this year, following a two-day Crystal Skull conference in Merida, our group of thirty travelled through some of the most important Mayan Temple sites, led by Mayan expert, shaman and spiritual guide, Miguel Angel Vergara and Mayan teacher Erik Solis. Myself and two other very experienced skull caretakers – Star Johnsen Moser and ShavatY – carried our skulls with us, as did of many of the participants who are also skull caretakers. 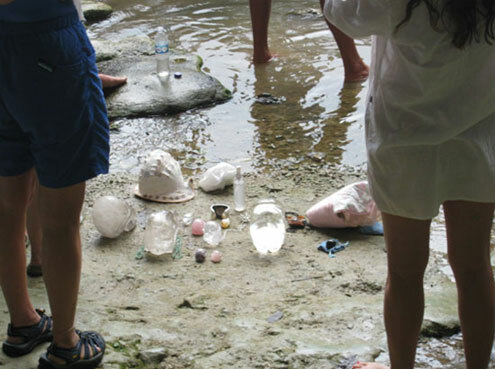 Our intention for this journey was to help to reactivate the Crystal Skull consciousness in the Mayan temples and within ourselves, through sacred ceremony. I felt very confidant that on this particular trip, we were going to be in very good hands. Both Miguel Angel and tour organizer Trudy Woodcock had been an integral part of the 2006 tour I’d been part of, so there was every reason to expect a very special experience. We were not disappointed! 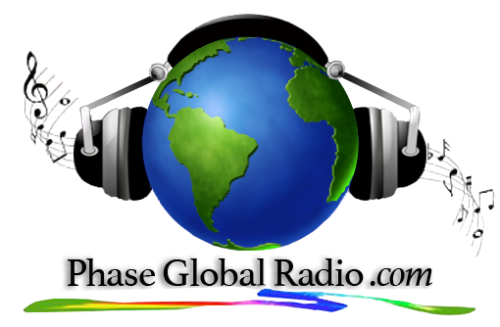 The chosen group of presenters was a global mix as were the participants. Michel Angel and Eric Solis from Mexico, Star Johnsen from the US, ShavatY from Europe, Richard Jelusich from Canada and myself from Australia, formed the masthead of an International group that included people from the US, Canada, Holland, the UK, Brazil, Trinidad and Australia. And I think it’s safe to say that what took place during both the conference and the two-week Journey of Hope, enriched the lives of every single one of those participants, in a most profound way. This large international group bonded so powerfully, that plans are already underway to reunite in the Yucatan next year, to continue the important work begun on this trip. I arrived in Merida with a sense of great excitement and anticipation, laced with a flutter of nervousness! I do not consider myself an expert on the Crystal Skulls, so to be invited to present at this conference felt like quite a responsibility. I’ve been powerfully and intuitively led into a journey with the Crystal Skulls – a journey that seems to be accelerating by the day. I’ve come to believe that these Crystal Beings are a vitally important part of the shift that humanity is currently undergoing. The more I allow myself to trust, and follow my intuition, the more the Skulls seem to lead me to places, people and experiences I could not possibly have imagined, four years ago. The conference in Merida was a wonderful way to start our journey. It was a time for us to get to know each other; to meet fellow skull caretakers and their skulls; to exchange information and open up to the energies of the land of the Maya, which has been linked to the skulls for thousands of years. It’s amazing how quickly like-minded people can become ‘family’! After just two days, it was sad to part from those who were unable to join us on the ‘Journey of Hope’. Goodbyes we reluctantly made, amidst promises to connect again sometime soon. Our first temple ceremony took place at Ake. Although it was March 21st – the day of the Solstice – it had been decided that Ake, rather than the more obvious Chichen Itza, would be a much better place for our first Temple ceremony. 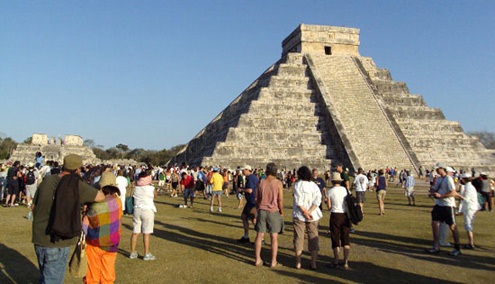 Being Easter weekend as well as the Solstice, Chichen Itza would be crammed with hundreds of people and be log-jammed with tour buses. What a wonderful decision….Ake is not a major tourist venue so we had the place almost entirely to ourselves. This is a simple site when compared to many of the elaborate pyramid structures of other Mayan temple sites. Simple but very powerful – the energies in Ake have a purity of essence that was reflected in my own personal and quite dramatic experience of the place. We set up our skull altar directly in front of the main temple with it’s beautiful towering, symmetrical columns. As we stood in a circle around the skulls, each person was cleansed with fragrant copal incense as Michel Angel called on the Guardians of the Temple and the Four Directions, for permission and blessings for the group. The purpose of our first temple activation ceremony was to awaken the sacred knowledge and send out a vibration of love and wisdom around the world – a message of Love, Hope, and Peace for the healing of our planet and humankind. Our ceremony complete, each of us was given corn and seeds so that we could make personal offerings, wherever we saw fit. I felt a strong pull toward the long path that lead directly from the main temple, to a large ‘Stela’ standing in the distance in front of another pyramid. Initially, I thought that I was heading toward the pyramid but as I walked, singing (channeling) to the land as I moved, the large skull headed crystal wand in my hand, directed me specifically off the pathway. As ‘my work’ progressed, I found myself moving backwards toward the pathway again. Then suddenly, I came crashing to the ground – corn, seeds and wand flying out of my hands! When the initial shock and pain subsided and I began to pick myself up, I realized my fall had been caused by a very large circular stone, situated about midway between the main temple and the Stela. There, lying beside it, was my beautiful wand, shattered into four pieces. Although relatively new to me, this skull wand had become a very personal and precious ceremonial tool. I’d acquired it at the World Mysteries Conference in Arizona last year, directly from its carver, world-renowned skull carver Leandro De Souza. I found myself repeatedly saying to myself, ‘Why has this happened, why has this happened?” as somehow, I felt that this was no ‘accident’. 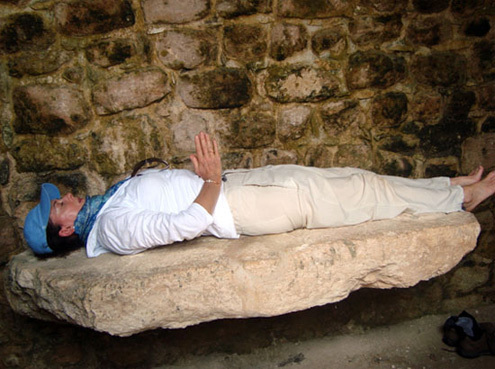 I picked up the four pieces and was led to do ceremony firstly on the rock I’d fallen over – I felt its connection to a very powerful energy below it, deep down in the earth – and then at the Stela beyond. This Stela had what looked like ‘blow holes’ in one side. As I left it, after singing into these holes, I was moved to place a piece of my broken wand inside one of them, as a gift. Unbeknownst to me, another member of the group had been a witness to my personal ceremony at the Stela. As I finished she said ‘Lia, have a look at the Stela again….it’s not just a Stela…” I turned to look at it with a gasp of realization – on one side this Stela was quite definitely the shape of a skull! Not only that, it was almost identical to the shape of the skull head on my broken wand which interestingly, had broken off – decapitated – to form a perfect ‘new’ skull. For me, this event on the first day of our tour indicated the significance of the journey we were embarking upon. Read Lia’s full adventure story here….. The following day we did go to Chichen Itza – the most famous and visited of the Mayan sites. There, as the sun was setting, we watched the descent of the Serpent of Light, as it travelled down the magnificent Kukulkan pyramid with the precision that the Ancient Maya Cosmologists predicted, thousands of years ago. Unfortunately, in the four years since I’d been there, many restrictions of access to the pyramids have been put in place. Doing any spiritual work within this important temple complex is not encouraged, so we brought our skulls in quietly and discreetly, and created our own sacred space amidst the tourist throngs. After an overnight stay in the beautiful city of Vallodolid, we had the treat of a ‘play’ day on the coast, at Rio Lagartos. We piled into boats and sped out from the harbour, to visit the pink flamingos amidst the mangroves – what a magical sight! 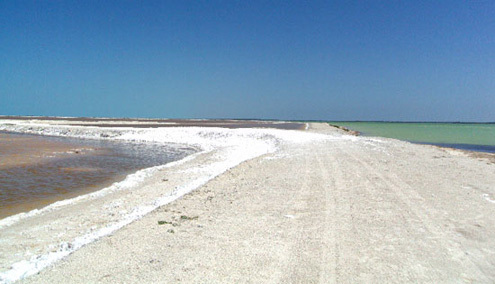 The sea in this part of the Gulf of Mexico is as thick with salt as the Dead Sea. I’ve never seen such a breathtaking, otherworldly landscape, with its colour palette of delicate pinks, blues and green. On the way back we stopped off at a special beach, to treat our bodies with it’s unique white clay – nature’s own beauty treatment – before speeding off to a perfect swimming spot to wash it all off, before lunch! From Rio Lagartos, we travelled to Ek Balam. I had loved the gleaming white magnificence of this recently discovered site on my fist trip to the Yucatan, and this visit has just deepened my connection to it. 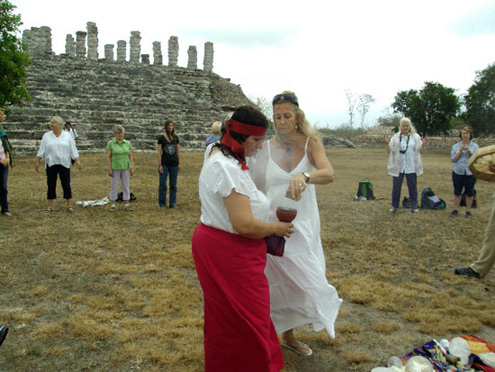 We climbed up the steep pyramid steps with our crystal skulls and, beneath the winged teachers above, we did our ceremony to connect with the ancient Maya teachers in the higher dimensions, in order to awaken the Sacred Maya Consciousness within us. There were many more precious moments in Ek Balaam, including another spontaneous ceremony within a chamber that the Ancient Maya used for massage and cleansing, in preparation to receive their initiations. The energy in this chamber was palpable, as was the realization that we were standing in the same place where those Ancient Maya once stood. It was with great reverence that some of us lay on the stone ‘massage’ table where they had once lain, feeling the strong presence of the Ancestors with us, in that moment. From Ek Balam we journeyed to the Temple Complex of Uxmal, which is arguably the most beautiful and powerful of the Mayan Pyramid sites in the Yucatan. Described by the Maya themselves as the University of the Divine Feminine, the physical beauty of this magnificent site with its Pyramid of the Magician, Governor’s Palace and the Nunnery Quadrangle, is surpassed only by the powerful energies that pervade its every nook and cranny. 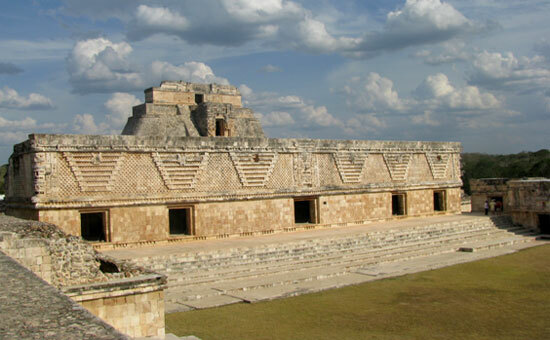 Uxmal is alive with aluxes – spirits that guard and protect the area. It was here in 2006, my first Crystal Skull, Jomcata Mayab, gave me his name, immediately after I’d experienced a breakthrough re-connection with Mother Earth, in a group meditation. On this more recent occasion, Miguel Angel led us to a part of the site I had not been to before. We set up our skull altar with almost total privacy, in a temple area off the beaten track. And we looked with joyous wonder, as Miguel Angel pointed out to us on the temple walls, carved images of crystal skulls surrounded by flowers. 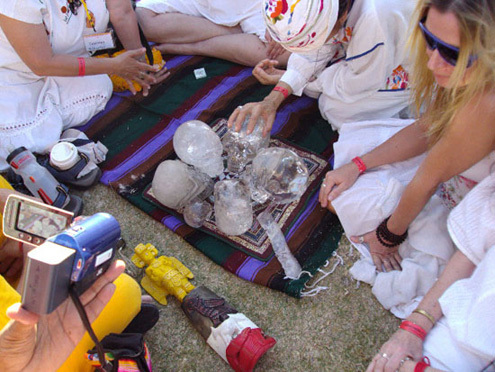 Our intention for this ceremony was to focus on making an inner connection with Mother Earth, in order to attain balance and harmony, asking that she bring Light into our lives and healing to prepare us for the awakening in 2012. After our ceremony, the hours we had in Uxmal seemed to evaporate! One would need days, if not weeks, to fully explore this magnificent site. Our next major Temple site – Palenque – involved a long bus ride to the north of the Yucatan into Chiapas, but Trudy had planned a sojourn at Tucan Siho Playa so that we could have a swim and some lunch to break the journey. Tucan Siho is a beautiful resort on the Gulf of Mexico (the hope is that the 2011 conference will take place here!). My skulls Jomcata Mayab and She’Shona and my new skull from the broken wand, declared that they wanted a swim! 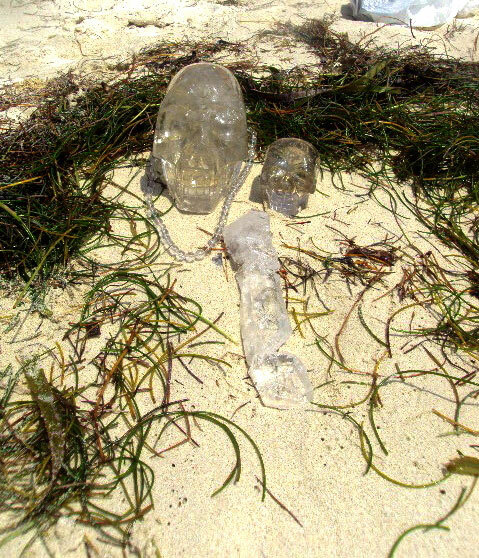 As I bathed them in the salt water, under the hot Mexican sun, I received distinct Guidance that I was to make an offering to the ocean, of the largest section of the skull wand that had been broken at Ake. I swam out and with a full heart, cast the crystal out to sea. I sent it forth with the intention that the energies this crystal had received from all the sacred places it had visited, and the ceremonies it had been part of, would be taken by the ocean to wherever they needed to be. As I stepped on the bus after lunch I said something to Trudy like, ‘How wonderful it was to swim in the Caribbean ocean!” “This isn’t the Caribbean” she replied, ‘It’s the Gulf of Mexico. It travels up the coast here and ends up in Europe!” In that moment, I realised that the energies of my crystal wand would travel around the world via the Gulf Stream – Divine planning at it’s best! Palenque was our next destination. This spectacular Temple complex, set in the foothills of the mountains in Chiapas, is surrounded by tropical jungle, which adds to its mystical charm. 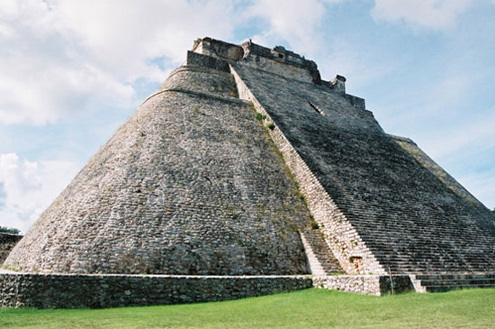 There are many magnificent temples within the complex, including the Temple of the Sun, the Temple of the Cross, the Temple of the Foliated Cross and the Temple of Inscriptions where the tomb of Maya Master, Pakal Votan, was found,. Palenque is connected with the prophecy of the Crystal Skulls and the end of the Maya Calendar. 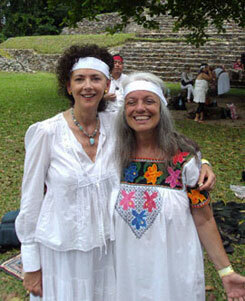 It has one of the highest spiritual vibrations in the Maya world. In the bus on the way to Palenque, I was full of nervous excitement. We’d been told that we were going to meet up with Kajun and his skull, which made this a momentous occasion for me. As always, when entering any sacred site, Miguel Angel had us pause to ask permission from the Ancestral Guardians of that place, to enter. We did a small ceremony before proceeding toward the Temple of Inscriptions, where Kajun and his skull were waiting to greet us. As I entered the site, I felt a well of emotion rise up within me. As soon as I saw Kajun and his skull, the tears started to flow. Because Kajun is one of the Lacandon tribe who are guardians of Palenque, we were allowed to do full ceremony within the site. Our first ceremony took place in front of the Temple of Inscriptions where each of us was given a white headband to mark the significance of occasion. We then proceeded to the sacred tree where, in 2006, we had also done ceremony. It’s believed that from this spot, many of the Ancient Maya ascended into other dimensional realms. Time seemed to suspend during this powerful ritual. At each ceremony in the sacred sites, Miguel Angel, Star, ShavatY and myself as skull caretakers, became conduits to bring the energy through for the group. 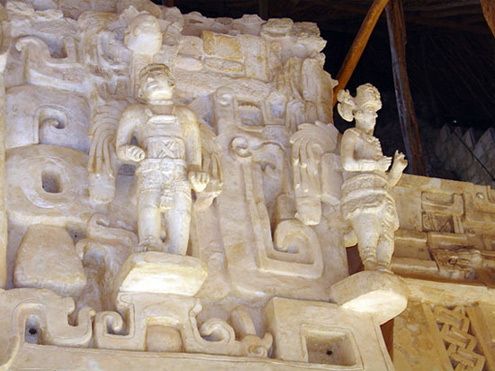 Our purpose in Palenque, was to connect with the Maya High Priest Pakal and his mother Zak Ku, White Heron (the Red Queen) asking that we become part of the awakening of the Maya Sacred Wisdom, in preparation for 2010. 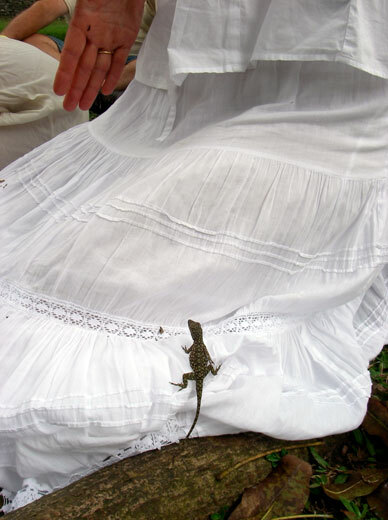 Just before I channelled through the Sounds of Sirius, Kajun noticed a little lizard nestle in my skirt – a powerful sign for him, that the Ancestral Guardians of the site were with us. 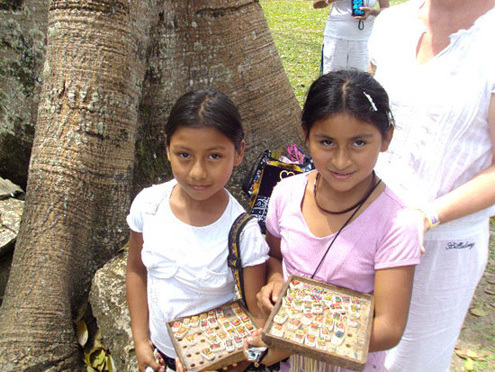 Two beautiful little Mayan girls sat with us for the full ceremony – well over an hour long – which demonstrated the potency and enveloping nature of the energies surrounding us. Later, outside the temple gates, I had the privilege of meeting Kajun’s father, K’in Garcia. K’in Garcia is the last surviving chief of Lacandon tribe, which today numbers only about 700 people. You can see the Lacandon people at Palenque, wearing their traditional costumes and selling their traditional hunting weapons to tourists. 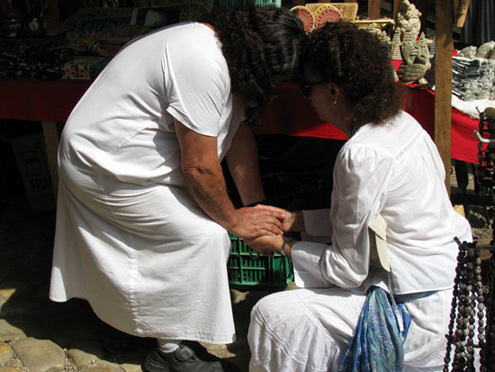 As I placed my skull Jomcata Mayab in K’in Garcia’s hands, something very powerful happened. An intense heat was generated through both of us, and we were pulled to our knees by the force of the energy. We left Palenque early next morning to make our way to San Cristobel de Las Casas, via the very newly uncovered site of Tonina, The main temple in Tonina is 80 meters high and built on the side of a hillside. Climbing to the top with heavy crystal skulls under the Mexican midday sun is a real test for any Spiritual Warrior! This site is described as the Precious House of the Mother and is connected with the nine Lords of our Solar System. Our intention here was to connect our Crystal Skulls with the energy of mother Earth and the energy of the nine planets, in order to help the Mother with the transformation of our Planet. In Tonina – as at Uxmal – we saw carved glyphs of skulls surrounded by flowers, representing the joy of achieving the Mystical Transformation of pure consciousness and a free spirit. It had become very clear to us on this journey, that the world-view and way of life of the Ancient Mayan people was extremely sophisticated and that they had left complex teachings for us on their Temple walls. The Mayan understanding of what was necessary to achieve conscious enlightenment, is outlined in great detail throughout all the major Temple sites. 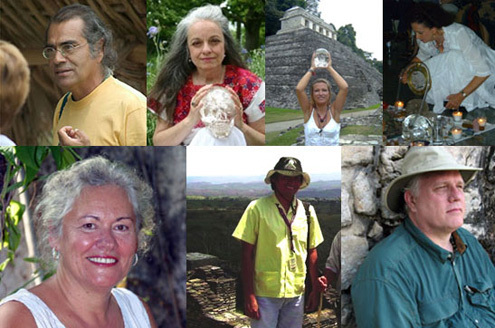 Everywhere we went – Palenque, Chichen Itza, Uxmal, Tonina and other sites – we saw images of the skulls carved on the Temple walls. In the centre of the Ball Court in Chichen Itza for example, an elaborate carving of a skull is found, out of which emerges seven serpents. These serpents represent the seven levels of consciousness that have to be reached before Crystal Consciousness can be achieved. This skull image symbolises the decapitation of the ego, resulting in the release of the kundalini energy (kundalini serpent) at each of the seven levels, before the highest level of Crystal Consciousness can be achieved. 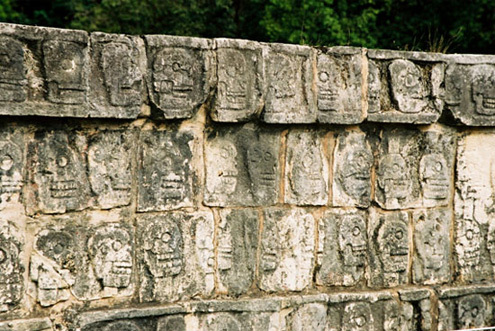 The message is repeated with great impact, on another wall in Chichen Itza, carved with multiple lines of skulls, with the adjacent walls again demonstrating the journey to enlightenment, as each level of consciousness is mastered. 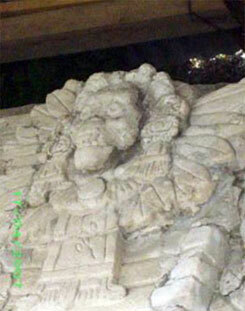 Images of skulls in Chichen Itza other Mayan Temple sites, do not refer to human sacrifice or physical death. This theory is a distraction, dreamt up by modern day ‘experts’! These Temples were universities where advanced initiates came to learn the disciplines of spiritual mastery. The decapitated skulls refer to the mystical death of the lower psychological levels of the self. They depict the ultimate goal of the Spiritual warrior, which is to overcome – to ‘die’ to – the negative and denser emotions of anger, fear, greed, pride etc, in order that they might achieve Crystal Head Consciousness. 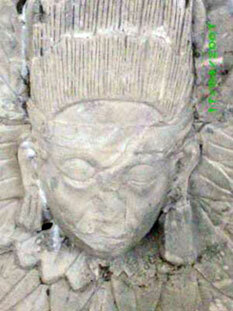 In Tonina, the Mayan teachers make it very clear that decapitation of the ego is the path to Mystical Transformation. 95% of statues in Tonina are decapitated and a wall in the main temple has a very large skull as its centrepiece, surrounded by flowers (photo above) – depicting pure consciousness without the ties of ego! For the Ancient Maya, the skull was a dynamic, symbolic representation of a most profound spiritual process. 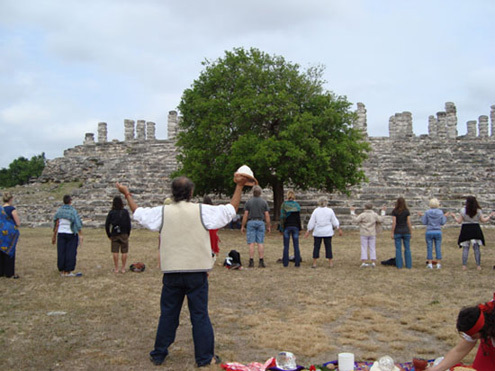 Their teachings on the subject left on the sacred temple walls, are the reason that groups such as ours, are finding their way to the Yucatan. Now, with the help of Mayan teachers such as Miguel Angel Vergara and Eric Solis, these teachings are being deciphered and rediscovered by modern seekers of the truth. 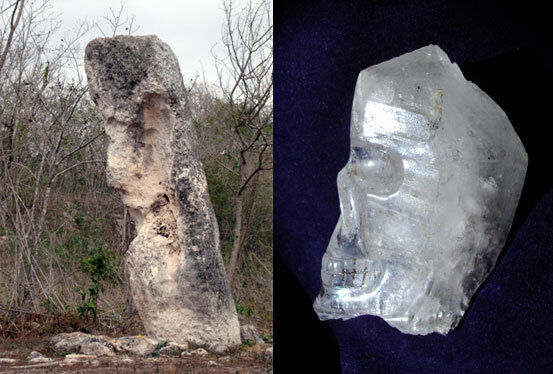 These Mayan carvings and glyphs can lead us towards an understanding of the knowledge held within the Crystal skulls. There seems little doubt about the importance the present day Elders of the Maya, as well as other indigenous peoples, attribute to the Crystal Skulls. Miguel Angel related a story of an Elder he knows personally, who is the guardian of two ancient Crystal Skulls. This Elder keeps the skulls’ whereabouts totally secret, for he says if they are removed from the earth before the time is right, the whole axis of the planet will shift. From Tonina, we continued north through Chiapas to San Crisobel de Las Casas. As we walked through the market square in front of the church of San Juan Chamula, it felt like we had crossed the border into another country. The people look physically different from the other Maya we had seen – more akin to the Native American Indian – and their traditional clothing was colourful and most beautiful. It was Easter Monday, so when we entered the Church of San Juan Chamula, the Easter Ceremonies were in full swing – it was like stepping into another world. The air was thick with incense and the floor covered in hundreds of candles – offerings from family groups dotted throughout the church. The church elders dressed in thick black coats of shaggy wool, kept a watchful eye over all the proceedings. This mystical church of the Maya Chamulas is a place where the Maya traditions are still very much alive. 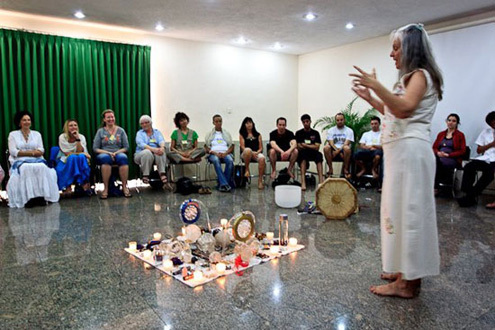 Christian rituals have been blended with Mayan rituals, to create a totally unique and potent form of worship. Although this is a Catholic church, the Elders have complete jurisdiction. No photographs are allowed, as the church is absolutely sacred to the people. Anyone who ignores this rule could very well find themselves in the custody of the Elders and even possibly, in jail. I found myself drawn up towards the main altar where a group of musicians in traditional dress, played and sang mesmerizing chants over and over. One instrument being played was unlike any I’ve ever seen – a combination of harp and cello. As I stood next to these musicians – several of them in a state of ‘meditative trance’ after many hours of chanting – tears flowed down my cheeks. The melodies enveloped me and struck a chord deep in my heart – cracking it open to receive the pure Love that emanated throughout that place. Four old women sat next to the musicians, tending large incense burners emitting clouds of pungent scent, whilst high up on the side altar, an old priest changed the garments on the figure of Christ. Assisted by several elders from below, who dipped into various baskets full of vestment cloths, this task was undertaken with a mixture of reverence, practicality and sacredness and mirth! And all the while, Mayan families sitting on the marble floor with babes in arms, along with ‘tourist’ onlookers like us, watched each and every move of the unfolding pageant with awestruck fascination. It was a ritual that seared into soul but in a most gentle and loving way. I forced myself to leave this haven of Sound, Light and incense, to make my way back to the waiting bus, but the experience in that Church is one I shall never forget. We had another wonderful experience in San Cristobel that evening. Star, who now lives in Mexico, had arranged that we visit her friend Don Sergio Castro at his Museo de Trajes Regionales. The extensive collection in the museum are gifts from the many people he has helped during the last five decades. The large collection of costumes, textiles and other items ranging from musical instruments, tools, masks, celebratory and religious artifacts, come from various Chiapaneca indigenous Indians. This collection is very rare, as the clothing and personal possessions are typically buried with the deceased and some pieces are no longer reproduced in the same fashion. For more than 45 years Don Sergio has devoted himself selflessly, to building schools and water catchment and filtration systems for the indigenous villages lacking this basic infrastructure. In addition, the majority of his time is spent providing medical and wound care to burn victims of Chiapas. The museum helps fund Sr. Castro’s humanitarian efforts. From the beautiful town of San Cristobel, we drove through the mountains back to Palanque, stopping on the way at the magical waterfall of Misol Ha, to do a cleansing ceremony under the falls. The water here falls from a height of 120 feet into a deep pool surrounded by lush vegetation so, for those brave enough to venture, it is an exhilarating and refreshing experience – as well as a spiritual one for some. 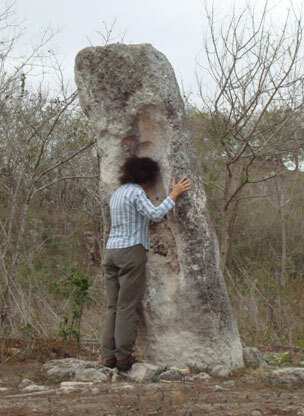 My memory of visiting Misol Ha in 2006 was electric. As soon as I walked into the site that first time, I burst into tears – so strong was the feeling that I’d been there before. Many photos from that visit were crammed full of Light orbs. In the bus on the way to the waterfall on this occasion, Miguel Angel told us about the dream he’d had the night before. In this dream, a very loving female presence had come to him. She told him that she was the Pink Lady of the Waterfall and that she was awaiting our arrival. It was a beautiful story that moved us and filled us with anticipation for our visit there. Unlike my first visit, there were hundreds of people at the site this time because of the Easter season. It was not as private as we would have liked but our ceremony took place nonetheless. Later, we received a most beautiful confirmation that the Pink Lady of the Waterfall had indeed been waiting for us. When Margaret Hinkson from Trinadad reviewed her video footage in the bus, she discovered the waterfall suffused with Pink Light!! Our journey was now regrettably winding to a conclusion. We had continually marvelled at the synergy and connection between us, from day one. Often in a group of this size, sub groups can develop but there never seemed to be any danger of this happening amongst us. For that, we felt incredibly blessed. Presenters and participants had bonded seamlessly – a testament to the powerful and cohesive energies of the Crystal Skulls and confirmation that the work we had come to do, was Divinely guided. On our way back to Merida, we stopped once more at the lovely Tucan Siho Playa hotel – the place where I had offered my crystal wand to the sea. It was the night of the full moon and something special had been planned. 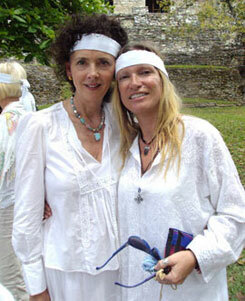 One of the group – beautiful Maia from Brazil – had offered to share her full moon ritual with us. Maia’s upbringing and spiritual training have given her an intimate knowledge and love for the plant kingdom. 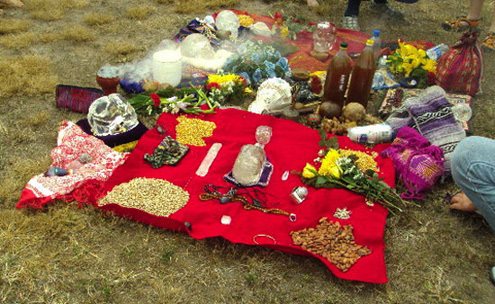 The full moon ceremony she planned, involved the use of many special plants to assist us with our intentions. As she explained, the full moon is a time when energies are amplified. It is a time ripe with new potential and the possibility of manifestation. After the incredible journey we had just travelled, what better way to spend our last full evening together, than to give voice to our most precious dreams, in sacred circle. We gathered on the beach as the sun was setting over the ocean. 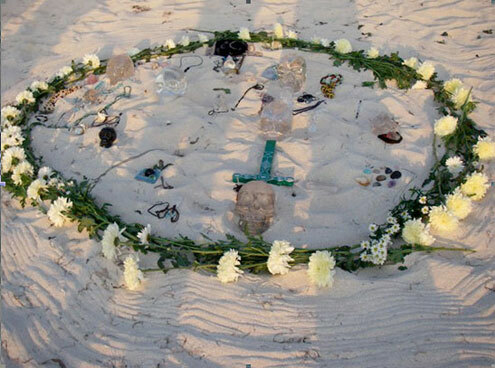 Each person brought with them their crystals and jewellery, laying it on the sand beside the Crystal skulls. 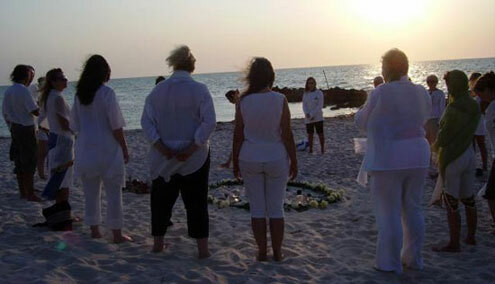 A circle of white flowers completed the mandala as the moon rose above us. It’s hard to describe the beauty and emotion of this ceremony. Each person in turn was bathed – head, hands and feet – with the plant water, lovingly prepared by Maia, as they asked the blessing of Mother Moon for the manifestation of their deepest dreams. It seemed a very fitting way to bring our journey to a close. We had one more Temple site to visit and one last ceremony. On our way back to Merida, we stopped at Edzna in Campeche. Miguel Angel told us that Edzna is the Temple of the Mantras. This is the house where the ancient Priestesses made the mantras and burnt copal and there are many rooms in the Temple, where the Priestesses received their teachings. Edzna is a place of very high vibration. One story tells of how when a very intuitive, handicapped lady was shown a map of the Yucatan, she pointed at Edzna and said that there were still some books to be found there. Our time in the Yucatan together had finally come to an end. Each of us had arrived there with hearts open to receive and that is exactly what happened. 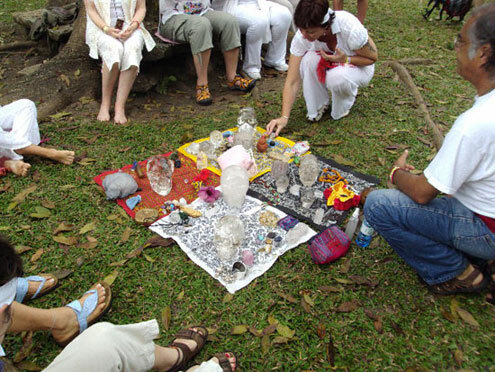 We received the gift of companionship with like-minded souls; we received many teachings from the Ancient Maya and we received many blessings from the Crystal Skulls. I personally, became clearer about my own role with the Crystal Skulls. It’s become clearer that my ‘job’ is to activate both the skulls and people with the channelled song and Light Language I feel privileged to be the conduit for. I believe that the Sounds of Sirius are helping to harmonize and align the Crystal skulls into a Grid of Light, and that once that Grid is fully aligned, all sorts of people who are ‘asleep’ will begin waking up to the remembrance of who they really are and why they are here. As each one of us works with the Crystal skulls and connects with them, we become a critical part of that Grid of Light. The larger and brighter this Grid becomes, the easier it will be for others to awaken and become part of it too! 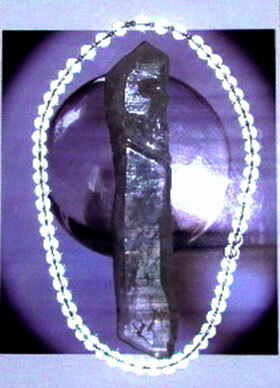 These beautiful Crystals Guardians are helping us to reactivate memories that lie deep within us. They are reminding us of our inter-dimensional and inter-galactic origins; they are reconnecting us with the Universal Source energy and knowledge; they are mirrors to our own souls, reflecting back to us who we really are, helping us to access the Divinity within ourselves; they are Guardians of Light who help us to expand our consciousness, guiding us along the path to Mystical Transformation. 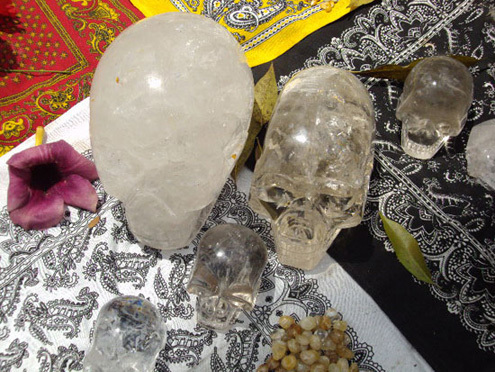 I believe the Crystal Skulls are agents for healing and teachers of Love, who are helping us to co-create a New World. Ultimately they are showing us that we are in the process of becoming the Crystal Heads ourselves! We too, are crystalline beings who can be conduits for the purest Universal Light and Knowledge. If you listen, the Skulls will lead you to the people and places you need for your soul’s development. 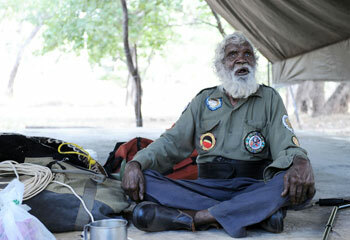 I saw this happen magically, just a few days ago again when through the most unlikely means, I had the privilege of meeting one of Australia’s last living Aboriginal Elders, Tommy George from Cape York. Tommy is now 80 and it’s been said that when he dies, 40,000 years of indigenous wisdom and knowledge will die with him. My Crystal skulls Jomcata Mayab and She’Shona came with me to my meeting with Elder Tommy and Victor and Victor’s friend Shea. We were two men, two women and two skulls together. None of these three aboriginal people had ever seen or heard of the Crystal Skulls before, but when the Sounds of Sirius channelled through me, I felt an exchange of information take place, particularly between Tommy and the Skulls. All four of us felt great heat generated and Victor felt energy being ‘pulled’ from him into the skull and felt lots of ‘people’ around both the skulls and me. The unlikely way this meeting came about and the speed with which it was arranged, signalled strongly to me that there was a Divine plan in all this, guided by the Crystal Skulls. The Skulls store information and I believe that Jomcata Mayab and She’Shona now hold the knowledge from the Aboriginal Ancestors, and that Tommy, Victor and Shea have received the information already stored in the skulls from the Mayan and other sacred sites. I gifted Tommy with two things from other indigenous lands – a necklace of Mexican Jade made by the Lacandon Maya, which sat on the altars at our skull ceremonies in the Yucatan, and a rock from the Four Corners area of Sedona, Arizona. The Four Corners area is named for the four individual Native American tribes that converge there. It feels right to me that some sort of symbolic connection has taken place between the Aborigines of this land and those places. Interestingly, this rock was as red as the desert sands of Central Australia & Uluru. Everything that we do ripples outwards energetically……like a stone dropped into a pond. 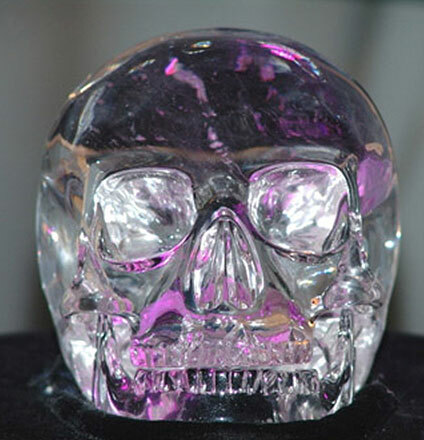 I believe our Crystal Skull Conference and Journey of Hope is already rippling out into the greater world. Who knows the effects it is having and will continue to have on our Planet. If you are reading this and feel drawn to join the group on next year’s journey, you will be welcomed with open arms. It’s time now for those of like mind to come together as family – to teach each other and learn from each other. The Crystal Skulls are drawing us together to do just that…..